Above, we see a baby Felix Klein and the Klein bottle which was later named after him. 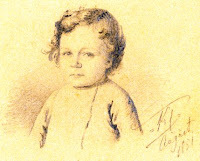 Baby Felix's German family probably didn't give him lots of useless presents around the holidays, and he turned out okay (aka brilliant mathematician/physicist). All of this going out an buying extravagant gifts for the holidays just strikes me as silly, and the Holiday Sales are already starting, trying to entice all of us poor people to dish out dollars for useless junk. So I thought I'd start a list of math-themed gifts under $15 that are sure to please. Everyone knows that mathematicians love to be disoriented -- or at least they know that being disoriented is nothing to be ashamed of. Don't remember what a Klein Bottle is? Take a cylinder and glue the ends together with opposite orientation. In other words, as you traverse clockwise around one end, glue the other end counterclockwise. Can't do it? That's because it can't be done in three dimensions without letting the cylinder intersect with itself. Acme Klein Bottles is a company that specializes in beautiful glass Klein Bottles that are, in general, pretty expensive. BUT, the good news is Acme Klein Bottles, there is a $10 option that may appeal to those conservationists/penny-pinchers among you. The Jigsaw Puzzle comes with a free band-aid! I ordered my very own DIY Music Box Kit, and made my own little music box! It was fun and you can do it too. Take a gander at Think Geek's Kit. AND Note that you can punch your own holes to compose an original backwards\upside down masterpiece. By the way, August Mobius is the namesake of this strip, which was also discovered by a man whose last name was Listing. But which sounds cooler "Listing" or "Mobius"? Yeah, that's what I thought. 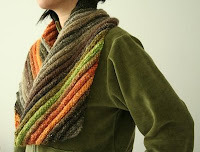 I have not tried this next one, but judging from my minimal knitting skillz, I may stick to the "Mobius Scarf", which I saw at Oiyi's Crafts Blog. Mathematician Sarah-Marie Belcastro generously provides instructions at her website for knitting these self-intersecting representations of the Klein Bottle. There is also a link to making hyperbolic baby pants. Really, Real Projective Space deserves more recognition here. I mean, it's disorienting too! In case you don't remember real projective space, it is what you get by taking a sphere and identifying (gluing together) antipodal points (i.e. the north and south pole). Since this space cannot be embedded (made accurately) in three dimensions (try it), we will make do with "Boy's Surface", which is an immersion (has self-intersection) just as our models of the Klein Bottle are. This immersion was part of Werner Boy's 1901 Thesis written under the Famous Mathematician Hilbert. The surface, which is pictured above, was discovered as a result of Hilbert's request for Boy to prove that no such immersion existed. So, even famous guys can be wrong! Courtesy of Joe Field's website, you can use just good old fashioned paper, scissors, and tape to make Boy's Surface. Lastly, I make the observation that all of these unorientable manifolds were first described by Germans -- coincidence? Yeah, Probably. But a funny one!